Hello! I know it’s been a few weeks since I’ve posted …work has been nuts, I was sick for a few days and I’ve not even been posting on Instagram. 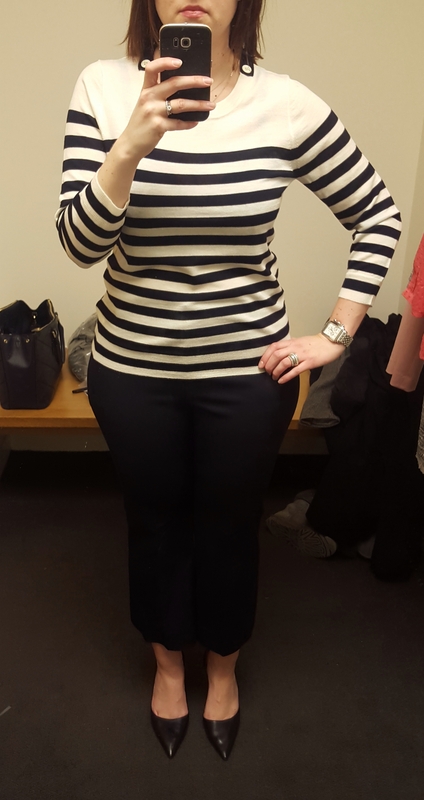 However, J.Crew had their new rollout for February this week, so despite not having a full price promotion on the new items, I ordered a few items and stopped in the store to try some items on as well. This rollout is usually that mid-point of winter when we’re ready to look at spring items but not quite ready to wear them. Or at least I can’t wear them in the northeast! From a color perspective, everything looks pretty cohesive (or perhaps I gravitated towards a certain color palette when choosing what to try!) Even so, it seems that navy and white is a mainstay for the first early spring rollout. 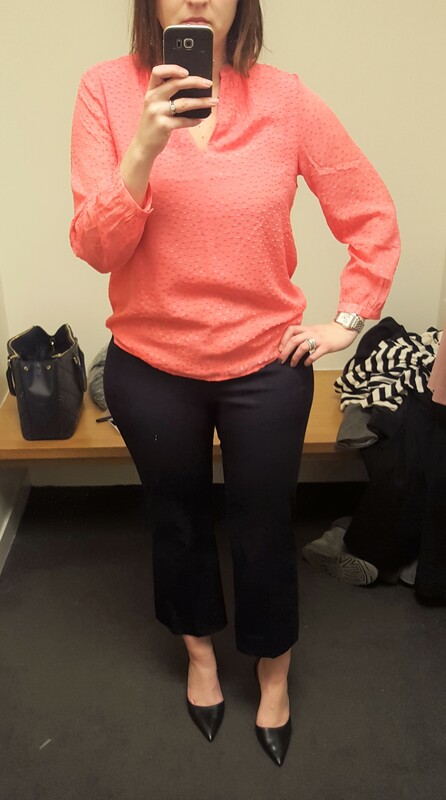 I will apologize in advance for the poor lighting in my J.Crew’s dressing room. First up, the Long-Sleeve Multicolored Tweed Dress with Fringe. I have a black and white tweed dress that similar to this from a few years ago and I LOVE it. It is incredibly flattering and I always feel amazing in it. This dress is a mix of grey, white, navy, and a little bit of coral which is tough to see in this photo. 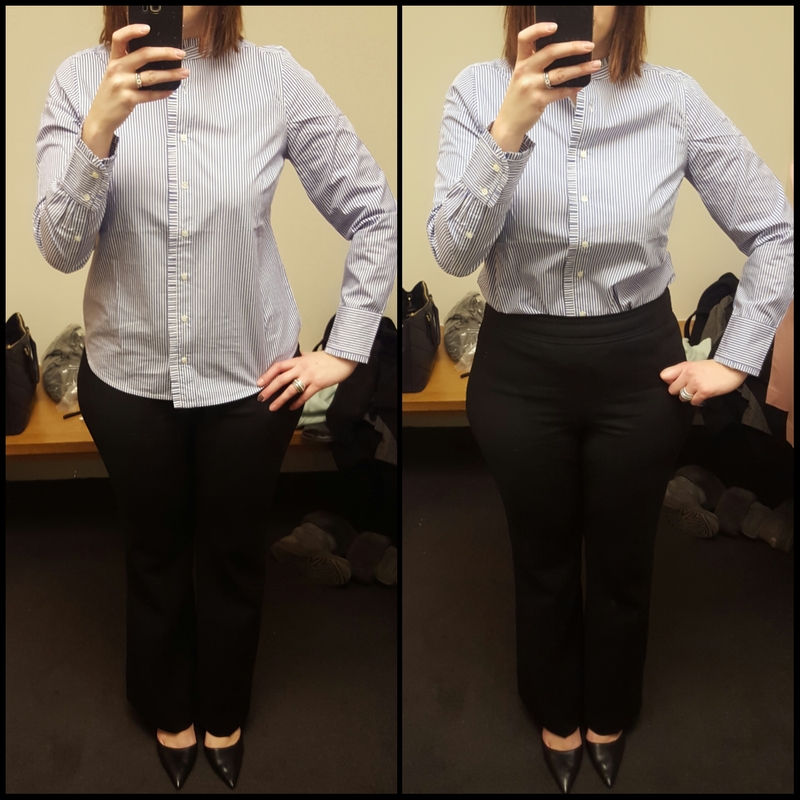 The waist sits higher and the waist band is somewhat thin so while I expected to have my shape enhanced a bit, the higher waist caused me to lose a bit of my curve. I felt like this dress managed to make me look straighter than I am, if that makes any sense. 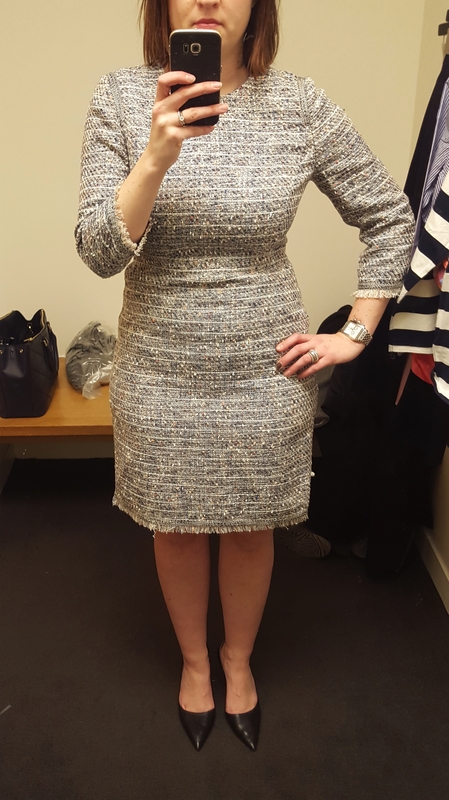 This is a size 12, which is my go-to for most dresses and it fit well overall, with a little room up top, which isn’t uncommon for me since I tend to need the size for my hips. 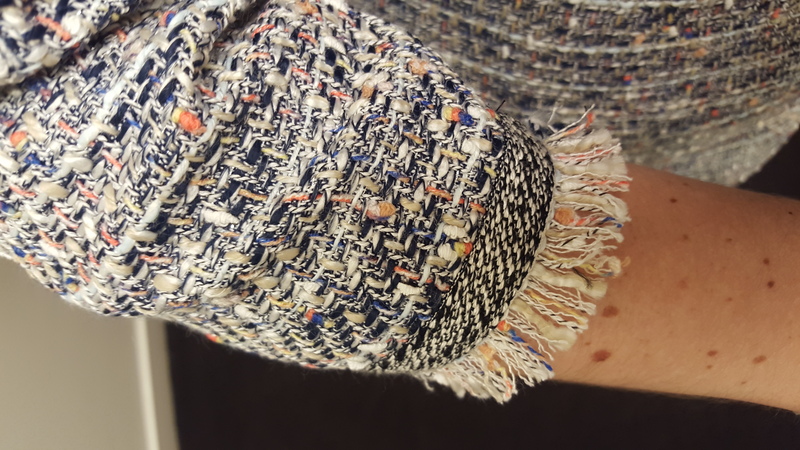 Here’s a closeup of the colors and the fringe. It wasn’t a perfect fit for me, and I already have a similar one so this was a pass but I can see this being popular. Hooray for it hitting my knees as well and not being too short! Next up is a skirt that I haven’t seen online yet and I unfortunately forgot to snap a picture of the tag. I liked the A-Line shape of the skirt and again, liked that it hit right at my knees (tough to see in the photo but it hit me about mid-knee and I’m 5’8″). I have a few striped pencil skirts but I would consider this one on sale. I’m wearing a size 12 which is my usual skirt size. Next up are the much talked about new Teddie Pants in Navy, which looked somewhat similar to the Campbell Capris, with a similar flare at the bottom. I am also wearing the Silk Clip Dot Blouse in Neon Dahlia. I am wearing a size 12 in both the blouse and the pants. I am a 12 in most of the cotton stretch pants – the Minnie, Campbell Capri and Trouser as well as the Martie pant. In most of the wool suiting pants, including the stretch wool, I tend to take a size 14. For me, the pants are a tad short at an inseam of 25 1/2″, so I would like to try the tall version of these which would get me another 2 inches in length – which is what I preferred in the Campbell Capris. The flare on them is more pronounced than the Campbells and I liked the rise on them – not too high but they’re certainly not low on the waist. And they have belt loops which the Campbell Capris do not. 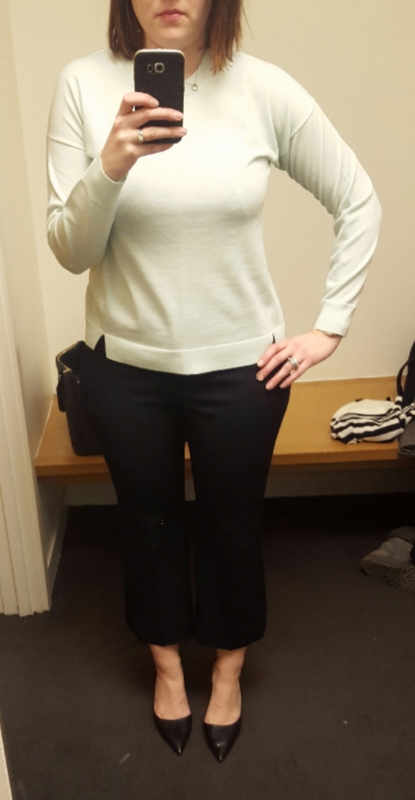 I will be sticking to the darker color of these pants, I tried the dusty pink on as well and they showed every lump and bump in my less than perfect legs. The blouse was a surprise love for me – I liked the color a lot and I don’t have any blouses in this color, so I will be adding this to my list. Next up, the Sleeveless Drapey Silk Popover in Deco Floral. This is not really in my color wheel, but I like the shape of the blouse and I think a lot of people will like the pattern. I’m wearing a size 12 in this blouse. The pattern also comes in a front-slit skirt , “dressy” shorts and a scarf. I don’t wear a lot of shorts but I like this pattern in the shorts! Next up is the Lightweight Wool Tunic Sweater in spearmint white which others have stated isn’t really a tunic sweater, but more of a boyfriend sweater. I tried the smaller of my two sweater sizes in a medium in this. The large looked sloppy. It is also hard to tell that this sweater is mint. My store only had about half of the colors in this, but I would consider the grey to replace another grey sweater I had from last year that I lost to moths over the winter. Now, on to more stripes…this is the Tippi Striped Sweater with Shoulder Buttons in the Navy/Ivory colorway. It also comes in a peach/twig and pool/persimmon color ways, neither of which really caught my eye. I’ll be honest, I took several photos with this sweater on before I realized my hair was covering the buttons. They seem like an odd addition to the sweater…put them on the shoulder but to me they look odd on the neck and unnecessary. I would have liked this sweater much more minus the buttons. I’m wearing a large, which is my go to size for the Tippi sweater lately, especially since I wash them at home and find they shrink up a tad when doing so. And another striped top, the Rugby-striped T-shirt with back zipper. This looked short to me, so I tried a large, I’m usually a medium or large in the tees, depending on the length. I might have liked this in a smaller size if it were a tad longer. The back zip has a long leather string hanging off it which I found to be annoying but it’s a little different for a striped tee, and I have always liked the wider rugby stripes. And last up, the Ruffled Button-Down Shirt in Stripe. I really liked the button-down online and was disappointed to see that this shirt had no shape and the collar didn’t lay right when you kept a few of the buttons undone. I tried it tucked in as well and while that looked a little better, this shirt could stand to have better darts and not be so straight. 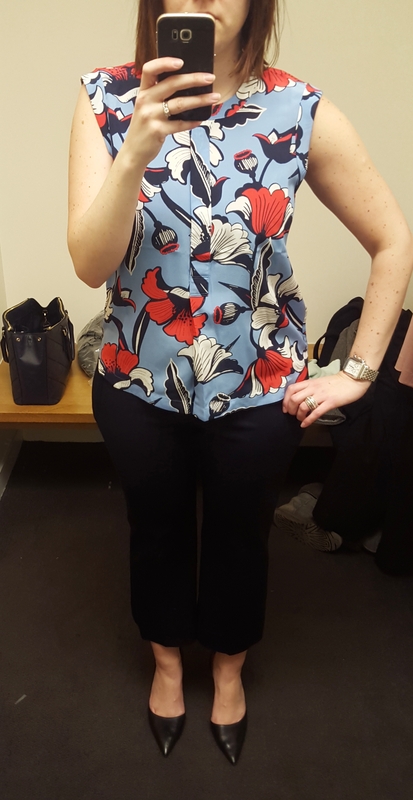 I also sized down to a 10 from my usual button down size of 12 and this was still roomy. 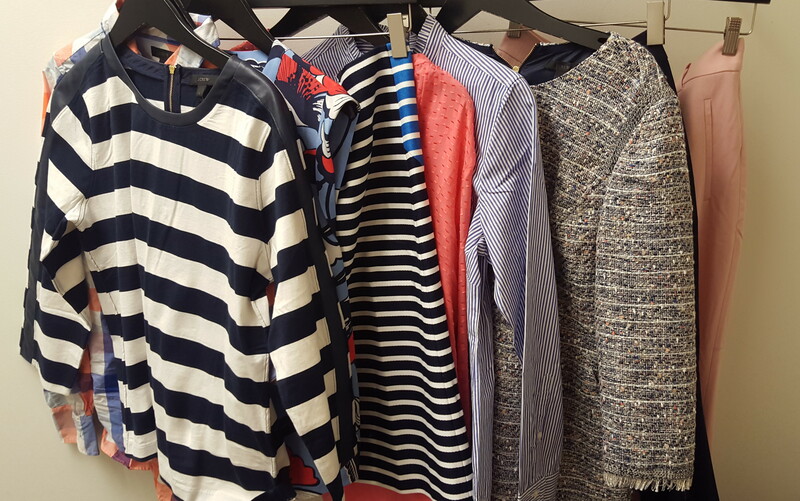 So, there you have it, a selection of the latest J.Crew new arrivals! I have a few other items arriving in the mail this week so I will post those when they arrive. What were your favorites from this rollout? What didn’t you like so much? Would love to hear what you think and thanks for visiting! 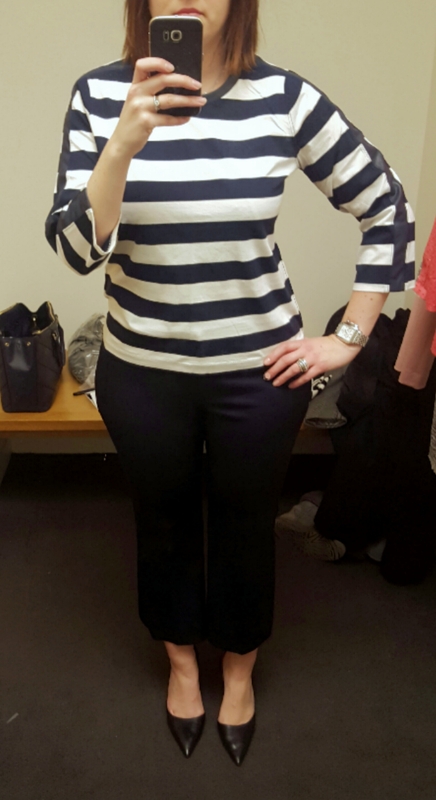 The stripe tippi looks amazing on you! Your waist is so tiny!!! I think that whole outfit looks nice with the teddies and the shoes. Thanks for the great reviews. Thank you so much!!! I would have purchased the Tippi had it not been for those buttons! Appreciate the feedback and thanks for stopping by! I love that striped Tippi too! I’m bummed that striped blue skirt is not available online… do you remember the price on it? Hi Julie! Sorry for the late reply… I think it was $118 but I’m not confident of that… Hopefully it pops up online soon! !